Riverside, C.A. — California-based avocado marketer, Index Fresh is talking about imperfect fruit, those less than perfect avocados. The ‘So Good – Grade 2 Avocado’ brand has a few blemishes on the outside, but taste just as good as a Grade 1 avocado. There are a lot of reasons why an avocado may be deemed ‘imperfect’ and marked as Grade 2 fruit. An avocado with sun damage or other scarring on its skin doesn’t always mean blemishes or brown spots on the inside. The avocado company partnered with Vevian Vozmediano (@VevianVoz), Personal Chef and Lifestyle Coach, for easy and delicious recipes using the ‘less than perfect’ fruit. “Imperfect fruit is actually perfect for so many recipes and the mango salad with avocado dressing is an excellent example of how we can use these avocados,” she said. Index Fresh is a worldwide marketer of avocados, sourcing from all major growing regions around the globe, including California, Mexico, Peru, and Chile. Through its dedication to quality, consistency, and innovation, Index Fresh continues to be a leader in the industry. Following early shipments the past couple of years, Arkansas tomato loadings are expected to be more normal time-wise with light volume starting around June 10. Primary production is centered in south-central Arkansas around small towns such as Hermitage. Shipments should continue until about July 20th. We’ll soon be entering the time of year when the bottom will drop out on Florida produce shipments as overall volume plummets. An exception is with Florida avocados. South Florida had 7,500 acres in the 2012-13 season, shipping 1.16 million bushels. This was higher than the 819,594 bushel average growers shipped on an annual basis between 2006 and 2010. Very light avocado shipments have started, but good volume will not hit until about July 1st. 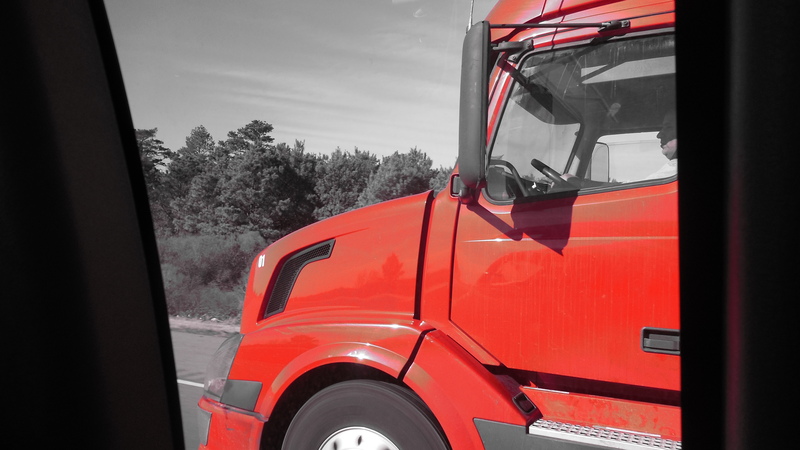 Peak shipments should take place in July through September. It is the tail end of the Florida shipping season for citrus, but there may be a little more product for hauling than originally predicted. The updated estimate shows an increase in grapefruit and a small decline in tangerines, with orange volume remaining the same. The grapefruit forecast has been increased by 1.3 million equivalent cartons in May from its April estimate. Colored grapefruit production increased 500,000 cartons while white grapefruit jumped 800,000 cartons, according to the USDA. About 95% of the state’s grapefruit has been shipped. The tangerines forecast has been dropped by 100,000 boxes to 3.4 million boxes. About 97% of the state’s honey tangerines has been shipped. As for oranges, volume remains at 138 million cartons, with the late season valencias volume staying at 71 million cartons. The majority of the Florida’s oranges are processed. As for the fresh market, about 70% of navels, half of the grapefruit and two-thirds of the tangerines are for fresh. 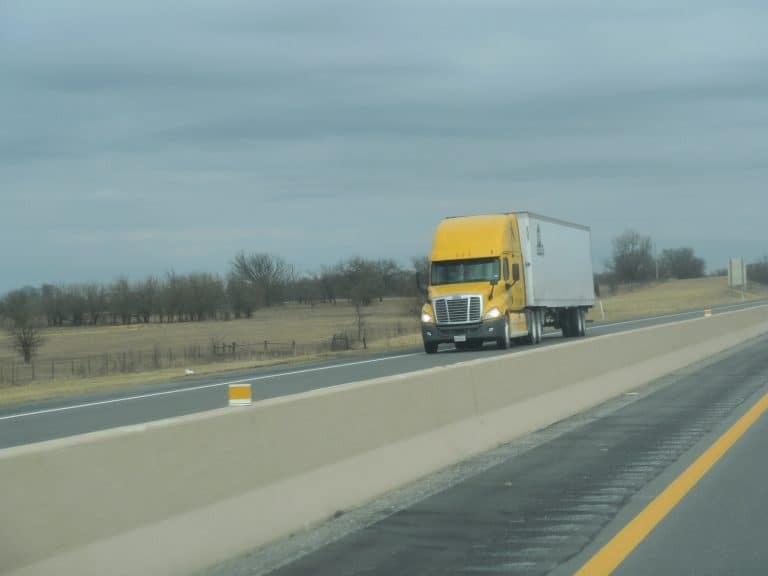 In-Transit Issues – Part V: How Safe are Modified Atmosphere Shipments? While studies have shown transporting strawberries and some other produce items in a modified atmosphere extends the quality and lifespan of the items, how safe are these food items to eat that have been exposed to carbon dioxide (CO2) for nearly a week? Rich Macleod, a scientist and basically the manager of the pallet divison for Transfresh Corp. feels this is a reasonable question for people to ask. 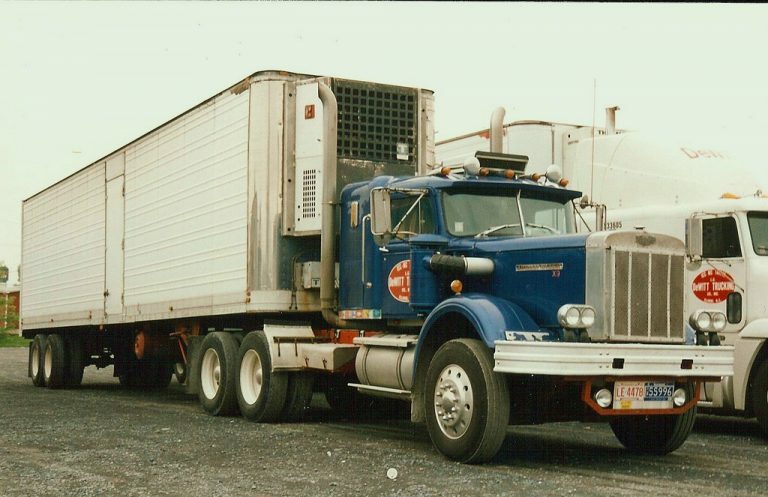 “The use of carbon dioxide in the handling of perishables is incredibally common,” Macleod states. He points to the use of CO2 in soda, which are the bubbles you see. 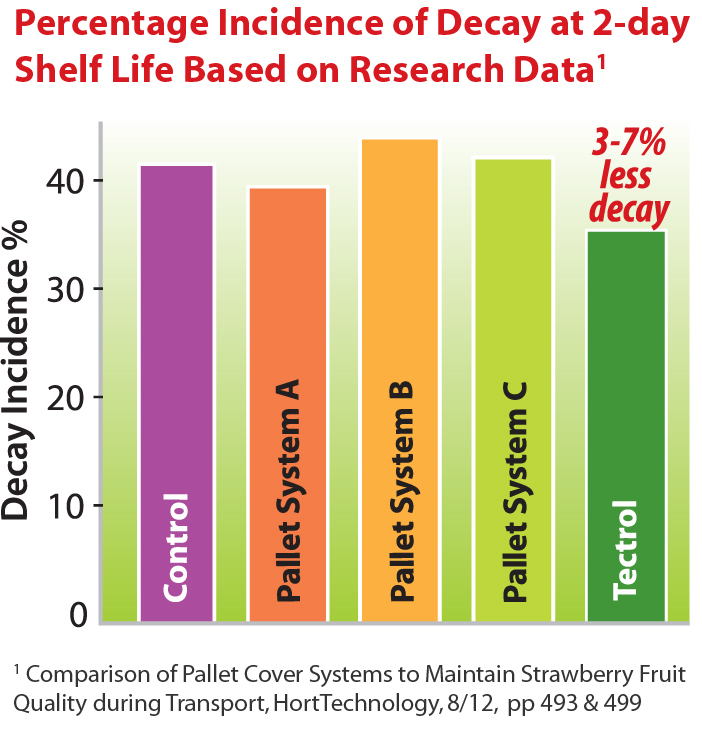 As previously reported in this series, using the pallet covered system, Tectrol (CO2), results in less decay in strawberries (see chart). Macleod, who started out as a lab assistant with a masters degree in post harvest science, sees the next step in research being to define what CO2 does for the nutrient value of strawberries. Such a study has never been done, he notes. He is hopeful such research will take place within the next five years. While Tectrol’s primary use is with strawberries, it also is used with raspberries, blueberries and other items. However, it also is found in containers on shipments by boat with items such as avocados, asparagus, and stone fruit for both imports and exports that are in transit eight to 10 days. “Your cut salads are all cousins to the wrapped pallet program (with modified atmospheres). 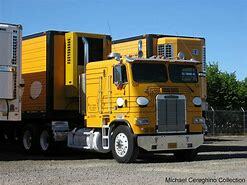 In fact, the cut salad program preceeded the pallet covered program,” Macleod says. While California is the top shipper of peaches, South Carolina and Georgia usually rank second and third, and not necessarily in that order, depending upon the season. Peach shipments from South Carolina will get started by early June, usually a few days later than nearby Georgia. However, it won’t be until good shipments come on several weeks later, you’ll have decent loading opporunities. Peak loadings should come just in time for the Fourth of July. An unseasonably cold March and disease could very well slash watermelon shipments from Central and South Florida by 50%. Western Michigan apple shippers apparently dodged the proverbial bullet last week, avoiding significant freeze damage, which would have been a scary repeat of a year ago, when most shipments were wiped out by the cold. It appears there will be be good apple shipments when movement starts this summer. Similar to 2012, Michigan growers have 36,500 acres in apple production this season. Asparagus growers in Southern Ontario have taken a hit as freezing temperatures took their toll on the crop recently. Frozen asparagus has a clear appearance and spears will droop as it warms up and should not be shipped. However, these plants will grow more spears. Avocados from Mexic0Produce truckers this season have already picked up a lot of avocado at ports of entry along the Southern border. Trucks have delivered nearly a million pounds of Mexican avocados to markets across the USA and Canada. However, this is only the beginning. Before the season ends later this year, a billion pounds of Mexican avocadoes will have been hauled to markets a cross North America.